Foreign Workers Paid Only $2.25 an Hour! Yesterday, Minister for Foreign Affairs and Minister for Law K Shanmugam had visited a foreign workers’ dormitory in Yishun and had said that the foreign workers “have no complaints about working conditions, about salaries, about their employers”. It was also reported that, “he also urged the foreign workers to voice out any other concerns with regards to their wages and living conditions”. Actually, it is perplexing why Shanmugam would form the conclusion that foreign workers “have no complaints about working conditions, about salaries, about their employers”. It is indeed curious because the non-governmental organisation, Transient Workers Count Too (TWC2) had actually been compiling stories of the ill-treatment and discrimination of foreign workers by their employers. In a survey that was conducted by the Singapore Management University (SMU), it was found that, “65% of injured and salary-claim workers reported that they had been threatened by their employers with premature repatriation. Of working workers, 12% have been so threatened”. In another study conducted by TWC2, it was found that, “only 28 percent of injured workers have been offered accommodation by their employer (sometimes, MOM) post-injury”. In fact, in a study conducted by the Ministry of Manpower, it was found that, “slightly more than half of total costs (to recover from workplace injuries and ill-health actually) fall on workers themselves, when quantified into dollar terms”. Which is why it is thoroughly perplexing why Shanmugam would not have known of these. Shamugam had also said that, “If there’s contrary evidence, we are happy to listen, because our task is not to deny evidence. In fact, we are happy to receive the evidence and deal with it … we are looking, searching (for evidence).” It is not known how many foreign workers Shanmugam had spoken to at the dormitories to come out with the conclusion that foreign workers “have no complaints about working conditions, about salaries, about their employers”, but the surveys that had been conducted to hundreds of foreign workers, which is undoubtedly more representative, says contrary. Thus we look forward to Shamugam “deal(ing) with” the evidence ” since their task is “not to deny evidence”. Yesterday, we received a pay slip of a foreign worker. The job of the foreign worker is to be a welder and he is paid only $2.25 an hour. 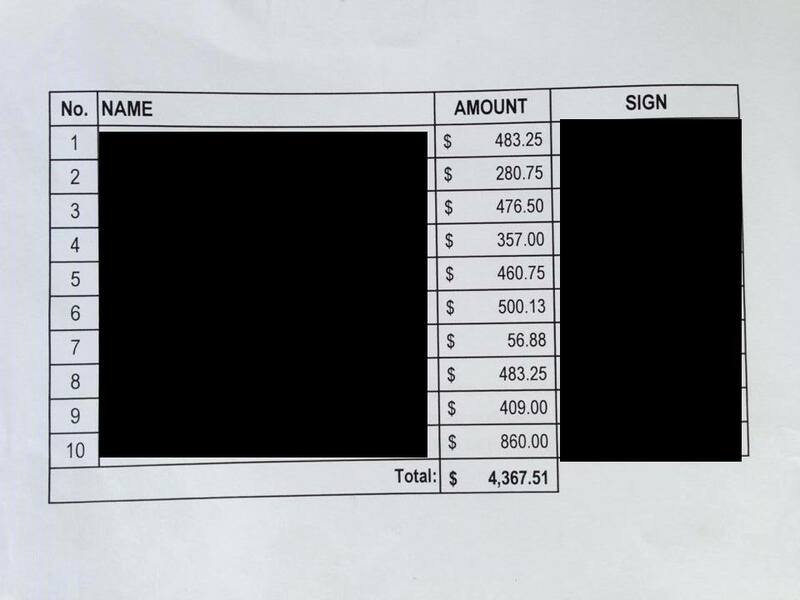 His monthly overall wage is only $500.13. In fact, all the other foreign workers also receive similar monthly wages, an average of $436.75 in a month. On top of the miserly wages, the workers would also have to pay a penalty fee of $200 if they lose or damage their work permit – which is almost half their monthly wage! According to the survey by the SMU, it was found that, “the threat of premature repatriation creates a lot of stress”. Also, “having uncleared debts incurred in agents fees also hung heavily over them”. From our understanding, the foreign workers who were being paid only $2.25 an hour had continued to work because of similar fears and had thus kept silent, in spite of the severely low wages and ill-treatment. 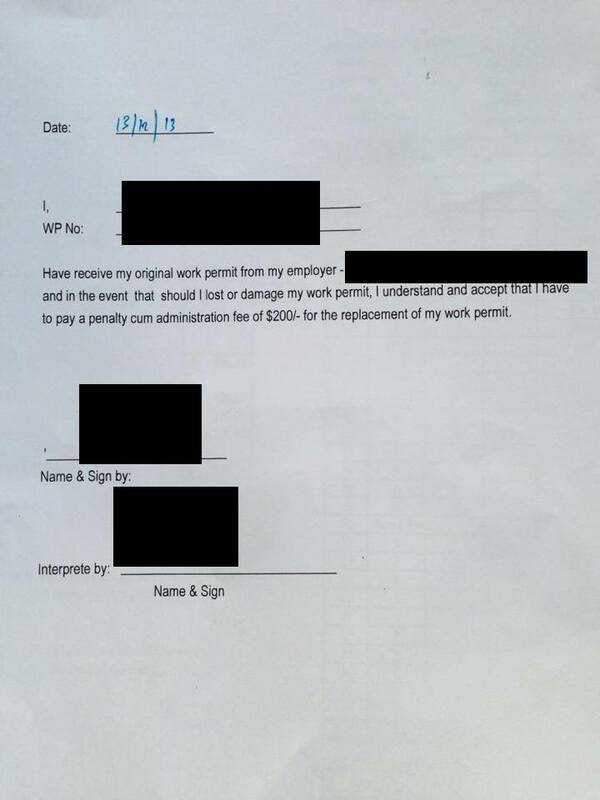 Shanmugam might have visited the dormitories to speak to the foreign workers but it is questionable if the foreign workers would have been willing to “voice out any … concerns” about these problems to him, especially under the careful watch of their employers. Indeed, according to the survey, up to 65% of workers have been threatened with repatriation and “such intimidatory behaviour by employers (apparently) seems very common”. In fact, in 2009, the MOM had “received approximately 3,770 complaints about salary related issues from foreign workers”. However, “only 4 employers were prosecuted for failure to pay salaries in that year”. Recently, the vice-principal of JurongWestSecondary School, Pushparani Nadarajah had asked, “How many of our leaders and top officers who say that every school is a good school put their children in ordinary schools near their home? (Only) until they actually do so are parents going to buy (it).” Similarly, for the policymakers, how many of them would be willing to earn $2.25 an hour in Singapore? And if not, should they subject the foreign workers to such low pay, or to even deny the problem of low wages? Should they step up their enforcement of wayward employers, instead of prosecute only 0.001% of the employers whom foreign workers have complained about being ill-treated? Indeed, the fundamental question we have to ask is this – is it humane to pay workers such low wages? Whereas the cost of living in Singapore is the 5th most expensive in the world, does it make sense to pay any worker a paltry wage of $2.25 an hour an expect them to make ends meet in Singapore? Perhaps our policymakers might consider them as labour to be contracted, used and sent back – which might explain the knee-jerk reaction to suspend “25 private bus services which ferry workers to the area”, to take away the only leisure activity that they can have, and to even consider “housing some foreign workers at nearby offshore islands”, as National Development Minister Khaw Boon Wan had suggested. In case our policymakers have forgotten, these foreign workers are human as well, and any human being should be treated with the basic respect and dignity that we would want to confer onto ourselves as well. It would be highly questionable if our policymakers deem it fit to pay themselves the highest political salaries in the world, but pay Singaporeans and foreign workers the lowest wages among the high-income countries. Such exploitation of the workers say a lot about a government, who would rather believe in “growth at all cost”, while allowing the “weakest” to be left behind. Indeed, Singaporeans have to ask ourselves – if we have a government which would treat the “weakest members” in our society with such disdain that would they treat the citizens with such unkind actions as well, and I think for many Singaporeans, we already have the answer. Shanmugam had “urged the foreign workers to voice out any other concerns with regards to their wages and living conditions”. Such “evidence” is tons a plenty. Shamugam wouldn’t have needed to visit a few dormitories just to prove the point that foreign workers “have no complaints about working conditions, about salaries, about their employers”. If he had only spoken to the non-governmental organizations such as TWC2 or the Humanitarian Organisation for Migration Economics (HOME), he would have at least heard of some of the 3,770 greivances that the foreign workers in 2009 have. Perhaps if our politicians would show some measure of civility, we look forward to them taking firmer actions towards errant employers and to improve the wage and living conditions of these foreign workers. 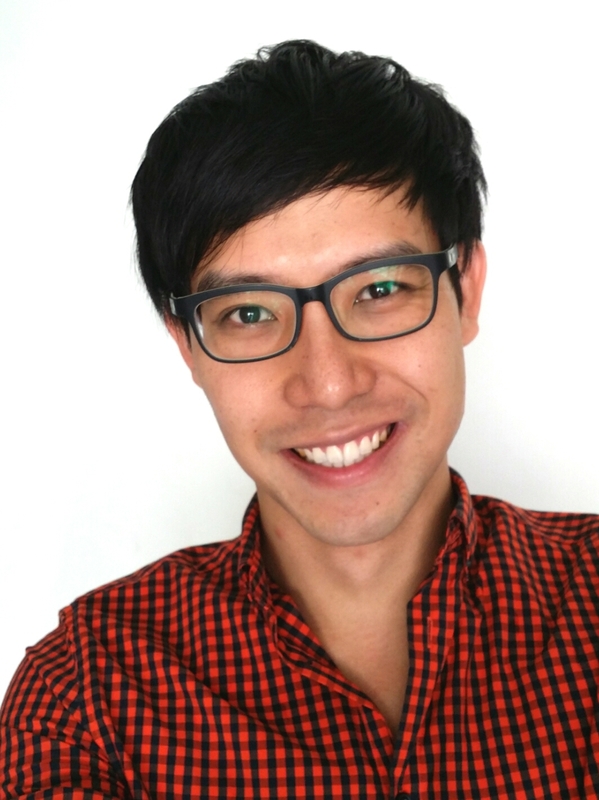 The fair treatment of foreign workers in Singapore have larger implications for Singaporeans – it is precisely because the pay of foreign workers have been so heavily depressed that the wages of Singaporeans are depressed and have remained stagnant for the past few years. Singaporeans are forced to accept lower pay, in order to be employed. In order for Singaporeans to receive fairer and more equitable pay, the MOM needs to be firmer in their responsibility to take action against irresponsible employers, and ensure that downstream, workers receive fair compensation for work performed. I really feel so sorry for these FW. Why are our ministers so adamant in allowing this “modern day slavery” in Singapore, is beyond me. What sickens me is their lack of human compassion and their outright endorsement to exploitation of cheap foreign labour. I dare say, if these FW were imported in to work for free, they will not hesitate to rope them in by the millions. This is how I honestly abhor this government. They are willing to pay themselves millions. They can at least make sure these FW have a decent wage and proper living conditions. This government is a disgrace to Singaporeans! Why don’t you start the ball rolling first? 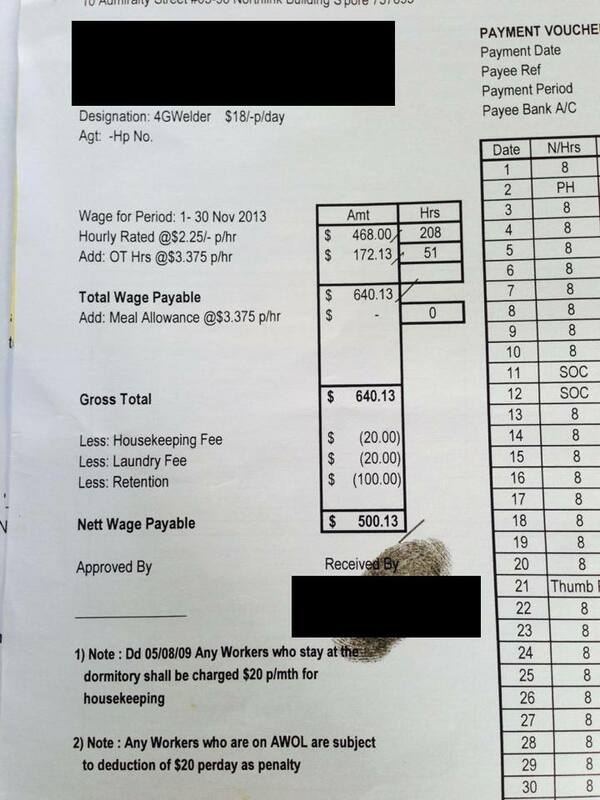 Can you pay your maid better, say at least $1000? How about your relatives? Do they have maids? You should walk your talk. We do not have maids. How about your friends? Have you convinced them? Have you even talked to them about this at all? It’s extremely easy to just talk only with the mouth and a loose tongue, without touching on other deeper consequences like inflation. (1) Work hours should be shortened to allow families to have more time for one another. (2) Wages for Singaporeans need to be increased. (3) Childcare services should be free and provided in the vicinity of the workplaces of parents to allow them to have ease of care. (4) More eldercare facilities should be provided for free nearby families. I gather these are all the government’s responsibilities. So, the need for maids is a failure of the government. Therefore, the way forward towards a solution is to the change the existing government. 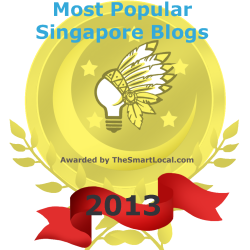 It seems like a giant prescient omnipresent all-powerful government is the panacea to all of Singapore’s problems. Republican ideals? I think we need God, rather than any government. We need a responsible government. You mean to say a pliant government made of divine beings at the beck and call of demanding citizens who wants the utopic best of all worlds, for, if not, the government is to be totally faulted and thrown out. We need mature thinking citizens who knows the pros and cons of things and who take their own initiative to practise into action before preaching. It’s quite simple. The government applies a heavy levy on foreign workers – including the maid. Every now and then they increase the levy, but zero cents of the levy goes to the worker. If the government is serious about being more humane to these workers, they can still increase the levy to discourage excessive dependence, and pass the majority or entirety of the levy to the workers to ensure that they are paid a living wage. December 17, 2013 - 11:37 pm hmm..
What do you mean by a “living” wage? Because that wage is enough to feed the whole family, send the children to school and pay for a house in a few years. Maybe you want Singaporeans to let them live as kings in their home town. PAP, a responsible government? Just look at the deceptive use of intransparency to pull wool over Singaporeans’ eyes. Now I begin to understand why our PAP Govt has stubbornly refused to implement a min wage, at least not because of the official reasons being given. Now looking at our PAP Ministers who demand the most obscene pay for themselves and yet don’t give a damn to the plight of our lowly paid workers, are they not greedy by any world standards ? How these foreign worker able to survive in Singapore with low salary?